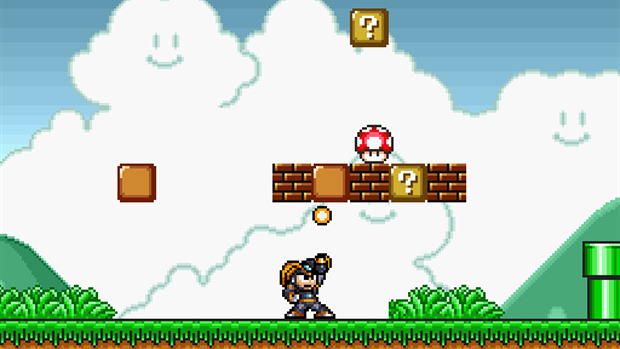 Super Mario Bros Crossover, a flash game which takes characters from classic videogames and puts them into a recreation of Super Mario Bros., has had an update in the works for over a year now. Version 2.0, which we first told you about last month, gives a major facelift to most elements of the game, with a skinning system that allows you to view interpretations of the game based on a variety of console platforms, add characters, and more. Yesterday, the update quietly went live, and you can go check it out now. I did a little run through of things and I'm pretty sure my favorite character is Sophia the 3rd from Blaster Master. But if you want to have some real fun, the most interesting thing I've tried is playing exclusively as Ryu Hyabusa. That dude gets around.